The career path of Jennifer Lawrence parallels the character arc of Katniss Everdeen, from reluctant combatant to reluctant heroine to reluctant messiah. Lawrence, fresh off an unlikely Oscar nomination for Winter’s Bone when she debuted in the first Hunger Games, is now a three-time nominee and winner for Silver Linings Playbook. At just age 25, she’s outgrown this franchise, and the weariness shows. 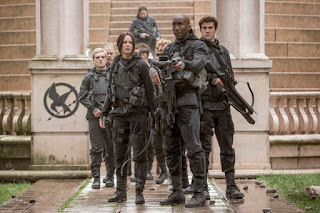 Mockingjay – Part 2 is the monotonous end to an elongated finale marching towards inevitability. The only change that came from splitting author Suzanne Collins’ final book in the Hunger Games trilogy into two films is the unfortunate subtext now accompanying talk of enemies that “do not share our values,” and its depiction of war refugees amassing on the Capitol, embedded with assassins bent on killing the nation’s president. And the sight of Philip Seymour Hoffman over 21 months after his death. Still the PR face of the revolution against President Snow (Donald Sutherland, the only actor who “gets” the inanity), Katniss is charged with wandering into war zones after the battles have been fought to film propos to motivate the rebels. She inexplicably pines for poor Peeta (Josh Hutcherson), last seen trying to strangle Katniss due to Snow’s brutal brainwashing, which we don’t see. Team Gayle (Liam Hemsworth) is summarily disbanded, and a bunch of characters get their curtain calls, like Effie (Elizabeth Banks), Haymitch (Woody Harrelson) and Caesar Flickerman (Stanley Tucci). Meanwhile, rebel leader Alma Coin (Julianne Moore) isn’t above bombing civilians in order to liberate the 13 Districts of Panem. It’s a two-hour-plus tedium of “shoot-yammer-kiss-rinse-repeat.” The dialogue is stilted and still stuck to the page, while the action sequences are sporadic and narratively inconsequential—it’s a movie about a war without the war. 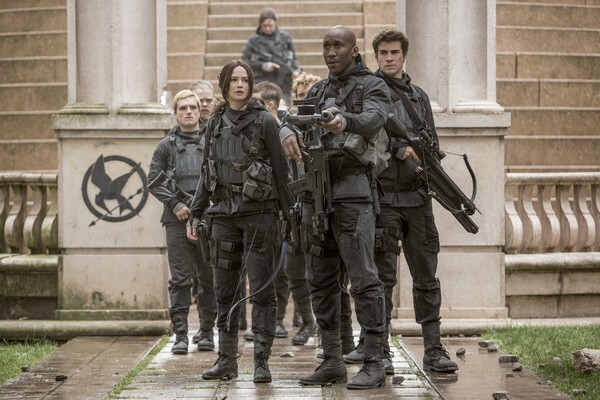 Instead, Mockingjay – Part 2 is about the ethicality of war, about the corrupting belief that the ends justify any means. But these messages are conveyed here in the most mundane, least imaginative terms. In the unimaginative hands of director Francis Lawrence, any intrigue and emotion are drained away in deference to dutiful adaptation—the most emotion Jennifer Lawrence displays is while yelling at a cat. The entire film exists to service a 10-minute twist you could see coming an entire movie ago, and the heroine who ultimately embraces the bucolic benefits of motherhood. This is how The Hunger Games end, not with a bang but with a whimper.